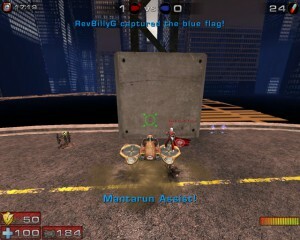 By default, when successfully performing a mantarun in VCTF, the one driving the manta is awarded nothing while the one sitting on the manta gets the whole nine yards. This Mantarun Assist mutator was built to fix that inconsistency. Manta drivers are awarded as many points and adrenaline as the flag carrier they carry, proportional to the mantarun time of the flag run. When assist points are awarded, it is accompanied with a message in pretty blue text and an announcer shouting ‘Assist!’ to provide an appropriate level of accomplishment. Finishing a manta run with Mantarun Assist on. RevBillyG, (MwM)dark_elf and ~*Constantine*~ for betatesting.